The owning of dogs is regulated by Ohio Law for the protection of citizens, and the well-being of the dogs. 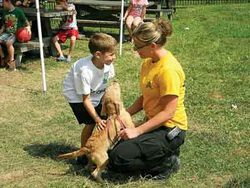 The office of the Washington County Dog Warden’s is a division of the Washington County Sheriff’s office and is governed by Chapter 955 of the Ohio Revised Code. The Dog Wardens responsibilities include the picking up of stray dogs reported running loose, making sure all dogs in the county are licensed, and enforcing the laws that govern these responsibilities. The Dog Warden is also responsible for investigating livestock kills by coyotes. All other services are courtesy of the Washington County Dog Warden’s Office, and are placed in a priority according to our State of Ohio legal obligations. Other services include: pick up of owned dogs, investigating complaints between neighbors over dogs, and cruelty and neglect complaints. Does the Dog Warden respond to problems involving barking dogs? Do we have a dog pound? When do you need a dog license? How much do tags cost?